How clear is your writing? Do you spend time editing to make sure that your message is clear and concise? Are your communications rambling? Sometimes community association managers or board members think that writing in legalese will impress their attorneys. Or that using long, technical or sophisticated words will sway homeowners to action. Long words and too many of them can make all of us feel like we’re spinning around in the endless loop of the old Abbott and Costello “Who’s On First?” routine. How do you get off that not-so-merry-go-round? “Less is more” is a lesson we can all learn from President Abraham Lincoln. Why am I saying this now? I read a very interesting op-ed essay in the Los Angeles Times, written by Ronald C. White Jr., a Fellow at the Huntington Library, and a visiting Professor of History at UCLA. He is also the author of a book entitled A. Lincoln: A Biography. 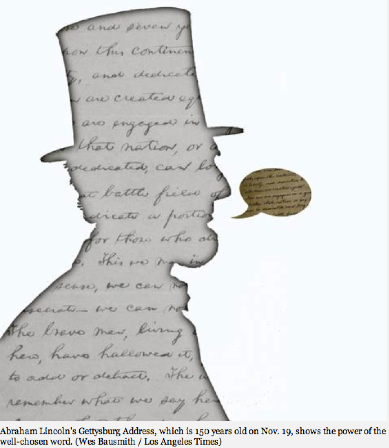 The focus of the op-ed essay was Lincoln (no surprise there) and the fact that the Gettysburg Address, which Lincoln gave 150 years ago, on November 19, 1863, is a testament to the power of choosing your words. Follow this link to read the op-ed piece. The Gettysburg Address is one of the shortest speeches in history, 272 words. Its final line is famous: “That government of the people, by the people, for the people shall not perish from the Earth.” According to White’s article, Lincoln wasn’t even the featured speaker at the dedication of America’s first national cemetery, in Gettysburg, Pennsylvania. That honor went to Edward Everett, the former president of Harvard, and widely regarded (at the time) as America’s finest orator. He spoke for more than two hours. Nobody remembers what he said. Lincoln edited his writing, something that all of us who are crunched for time find increasingly hard to do. It’s much easier to type something and press “Send.” That can leave us stranded in a gobbledygook swamp. Lawyers suffer from this problem as well. Take legalese for example. It is verbose and repetitive. It also uses too many words and says the same thing more than once. And one of those preceding two sentences needs to go back to the Department of Redundancy Department. See what I mean? There was also a recent PBS special, Lincoln@Gettysburg. It was about how the telegraph helped Lincoln manage the Civil War. When Samuel F. B. Morse invented the telegraph in 1844, it caused a communications revolution. But each letter required multiple keystrokes and cost money to send, so people watched their words carefully. Now, in the digital revolution, we can type entire phrases with only a couple of keystrokes, and send as many words as we want for free. Sometimes we send text messages that are not even made up of real words. This has made us less concise. And sometimes our messages become muddled. Consider your choice of words carefully, as otherwise your message may not be easily understood. For example, legalese is often (mis)used by non-lawyers who want to sound like lawyers. Or it is used thinking that is the way to speak to one’s lawyer (it is not). Most lawyers try to avoid using legalese and so should you. Legalese begs to be parodied. The wild and crazy Marx Brothers did just that in the 1935 movie A Night at the Opera. They literally ripped through contract negotiations. They tore up and threw out all the legalese, like “The party of the first part,” until they were left holding only a shred of paper. Groucho said, “That piece is standard in every contract; it’s the sanity clause.” To which Chico responded, “Everybody knows there ain’t no Santy Claus!” and threw the rest of the contract away. If you want to ensure that the reader understands your message, edit what you write, use fewer words and make the message easy to comprehend. Legalese, needlessly long words, technical jargon and the like can make it more difficult for the reader to easily understand your message. So we need to learn to write succinctly, using shorter sentences and words. It makes a difference. For example, as Americans, we are fortunate that we have had many leaders who spoke and wrote well (even before speechwriters became the norm). It is also one of our strengths as Americans that our leaders talk to us. We demand that they do. That was not the case in the rest of the world. Kings did not speak to commoners. At the end of World War II, when Emperor Hirohito went on the radio to announce that the war was over, the Japanese people marveled. The emperor was regarded as divine; they had never heard his voice before. This week is also the 50th anniversary of the assassination of President John F. Kennedy. He left us with another memorable speech that has become part of our national identity. At his inauguration on January 21, 1961, Kennedy urged every American, “Ask not what your country can do for you. Ask what you can do for your country.” Again, simple, clear language that conveyed the message. A colleague once jokingly said to me, “You’re not an attorney, you’re a fireman.” It’s true. I am constantly putting out fires. So, not only is the pen mightier than the sword; it can also put out fires. But only if what I write clearly conveys the message.